I definitely was concerned about a mailorder dress. However, I was so pleased with the quality of the dress, the measurements were exact, fabric was soft and just beautiful. I could not find anything like this locally. Was a bit worried about ordering online as in previous years they haven't been what the picture provided, not in this case the dress was stunning such a beautiful soft material that felt super comfy, i ordered red and the dress just sat so nicely and overall lovely dress highly recommend SimpleDress. This was my first time ordering a dress online and I was nervous about it thinking that it would be different to the picture shown. How wrong was I. I ordered it in a large size so that I could get it altered as I want to lose weight. The details are just beautiful. The colour is perfect. The weight is light. I am so excited and can't wait to wear it on our big day. One happy customer here. i wore this dress to my senior prom and it was amazing. when i walked into the room i felt like i was cinderella. i would definitely recommend buying this dress if you are looking to show off. if not i would go for a more sutble dress. totally worth the price! great quality. the glitter was everywhere in my room but that was to be expected. definitely buying from here again. This dress came in a day earlier than expected and looked great on my wife. We weren't expecting it to be of the quality that it was. The sequin was glitter. I've never received so many compliments on a dress!!! It is absolutely BEAUTIFUL in person!! The glitter catches the light in all the right ways, and this dress really does turn heads!! 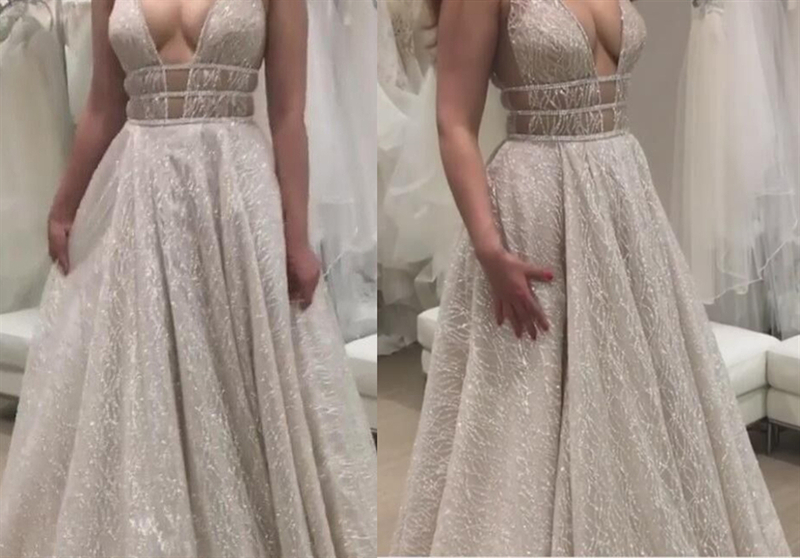 I felt like an absolute PRINCESS wearing this dress to prom! The glitter is very very loose, so I ended up getting a ton of glitter everywhere I walked or sat, but it was anything that I couldn't easily vacuum. I ordered my dress on March 3 with a rushed order and expedited shipping and received it on March 20, so you would definitely need to order ahead of time, but for the price and quality of this dress, it was well worth the wait!! Was so pleasantly surprised with this purchase!! An amazing dress for a steal. Love this dress!! Got many many compliments and felt like it just lit up the room. I'm 5'9" and I weigh 175 lbs and so I got the size 10 dress. I love it and plan to wear it over and over again!I thought the sequins might get annoying or itchy but surprisingly I didn't have any problems with it whatsoever!